Sundays are for relaxing, eating a hearty brunch to soak up the drinks from the night before, and it's a day for enjoying the Los Angeles sunny weather. As much as us LA locals love our warm weather, we don't get to enjoy it often enough due to sitting in our cars, in traffic 5 days a week. So, what's a way to take advantage of the almost always perfect weather in Southern California? 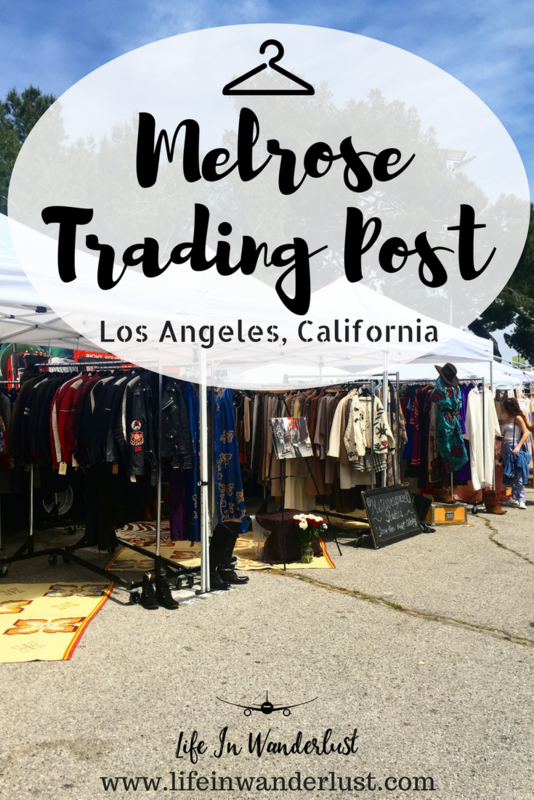 Take a leisurely stroll to shop and people watch at the Melrose Trading Post! This outdoor market place is not as big as the Rose Bowl Flea Market but it's curated with vendors with exceptional goods! Whether you want to find an antique lamp for your living room, a one of a kind vintage dress, handmade goods from local artists, grab a bite to eat from the array of food vendors, or listen to some live music, the Melrose Trading Post has it all in one place. Fun Facts: When you shop or sell at the Melrose Trading Post, founded in 1997, you are contributing to education! Located on the campus of Fairfax High School, the Melrose Trading Post helps fund the Greenway Arts Alliance, a nonprofit organization whose mission is to unite communities through art, education and social enterprise. You are directly giving back to the students at the Fairfax High School by helping fund their Arts Education program. The Melrose Trading Post has been such a success that it's been featured in numerous articles as one of the top destination to visit in Los Angeles, and featured in publications and media all over the world. You can expect to find thousands of visitors here every Sunday having a good time. What's even better? The Melrose Trading Post is dog friendly! Bring your furry best friend! Let's Go Shopping: So many artisanal vendors, so little time! You won't find your basic clothing options here. The Melrose Trading Post is anything but ordinary. Expect to find lots of vintage dresses, shoes, and retro pieces you that leaves you with a sense of nostalgia. One interesting booth I came across was a booth where you were able to get your portrait drawn. What a fun piece of art to take home! Entertainment: There's no shortage of entertainment at the Melrose Trading Post. One of my favorite things to do is to people watch. If you want to see some amazing street fashion and beautiful people, you will find a handful of them at the Melrose Trading Post every Sunday. Everyone here comes dressed to impress! OverHeardLA recently mentioned this! When you're done admiring the fashionistas around you, find a seat on the grass and listen to some live music. You can find the Sunday Line-Up on the events calendar and plan accordingly. Not only are there live music here weekly, there are also cultural events being hosted all year long. Keep your eyes on the calendar to make sure you don't miss out! Let's Eat: Can you really fully enjoy your picnic on the grass without grabbing a snack though? I didn't think so! The food vendors here changes weekly so you'll never be bored. You will be sure to find yourself a great coffee vendor, baked goods, diverse food options for people with different dietary restrictions, and plenty of spots to sit and enjoy your delicious food. With a little bit of sun and some leisure time, a visit to the Melrose Trading Post on a Sunday should be on the top of everyone's list of things to do while in Los Angeles. Hunt for treasures here while listening to some live tunes. Grab your seat on the grass after you grab your snack! This Sunday is going to be a great one! 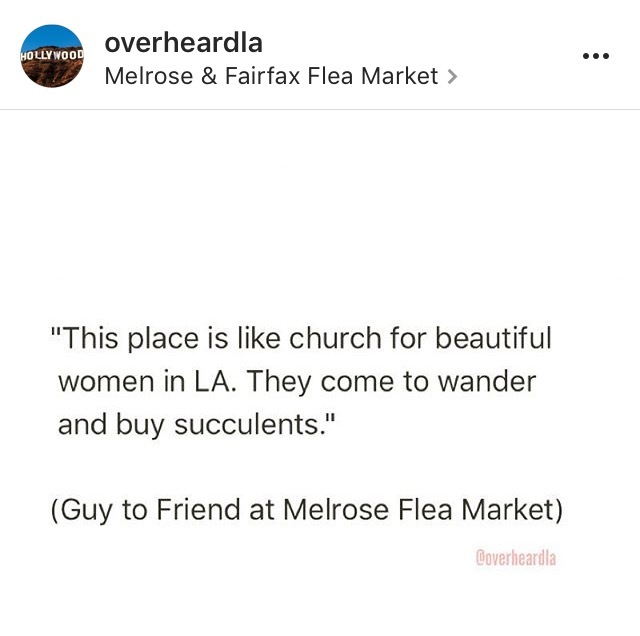 I hope you'll find something uniquely you on your visit to the Melrose Trading Post. Entrance Fee: $3.00, cash only! There is an ATM machine on site if you need it. Hours: Open daily 9am-5pm, every Sunday unless specified on website. Last ticket sold at 4:45 pm. Parking: Parking is first come first serve at the Fairfax High School's parking lot. There is metered parking, street parking in the surrounding neighborhood, and valet parking for $5.00. Great write up! Hope you can make it out to Topanga Vintage Market at Pierce on the 4th Sunday of the month some time! That typewriter is to die for! We absolutely love markets like this! Especially when we can spend a day in that glorious California sunshine! Yes!! You would love it, Alex! It's super eclectic & the food options are a plenty! Thanks for reading!